WhatsApp has got a significant feature update that is currently being rolled out. Lots of changes have been rolling out recently, such as Android Pie’s native notification inline photo support, swipe to reply gesture that was previously available on iOS to Android. Today, another feature is being added, which iOS users have been enjoying for the past few months, picture-in-picture video playback. 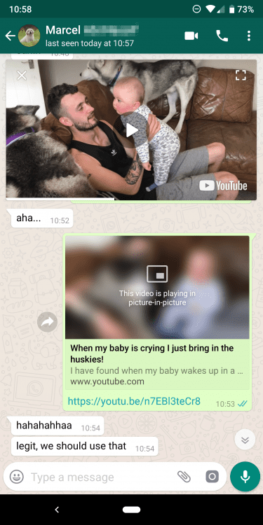 In order to use this new functionality, Picture in Picture (PiP), on Android, you need to be on at least WhatsApp Beta v2.18.301. Now, you will see that videos have something different added to the preview box, a little PLAY BUTTON. Currently, this feature is available for YouTube, Instagram, and Facebook videos. Once you select Play, the video then There’s a play button; tapping it makes it increase in size, repositions itself to the top of the chat and it starts playing. You can then reposition the window as desired and continue with your live WhatsApp chat underneath. Pretty neat I think! PiP currently supports YouTube, Facebook, and Instagram. 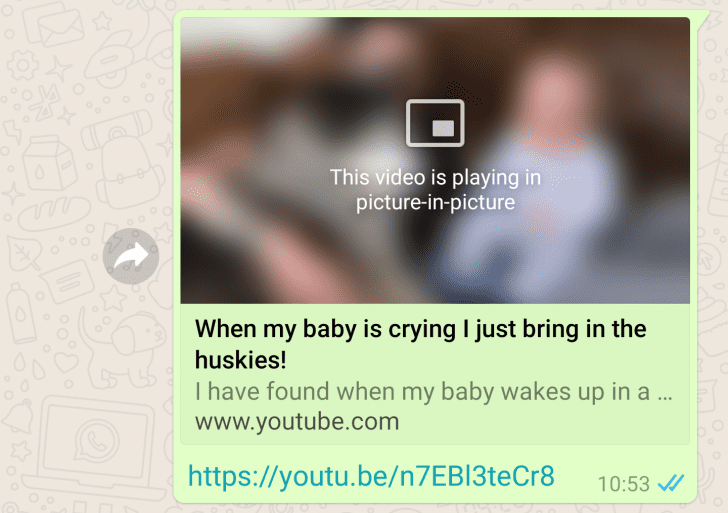 Twitter videos do not work and neither do WhatsApp videos that have been directly sent to you. Seems a bit weird that, but I’m sure this will be remedied by the time the official non-Beta version comes out. 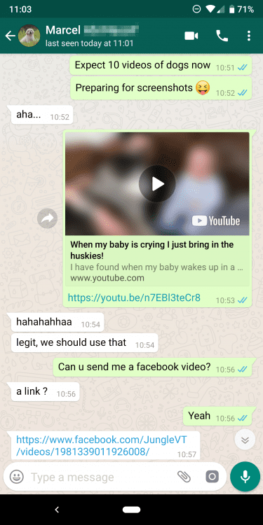 Want to join the WhatsApp Beta program? You can do that by joining the official Play Store beta program or you can head on over to APK Mirror and grab the file there.